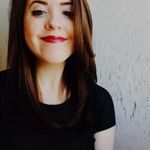 The 2019 Wedding Dress Trends That You Need to Know About | Wedding Ideas ARE YOU A VENDOR? 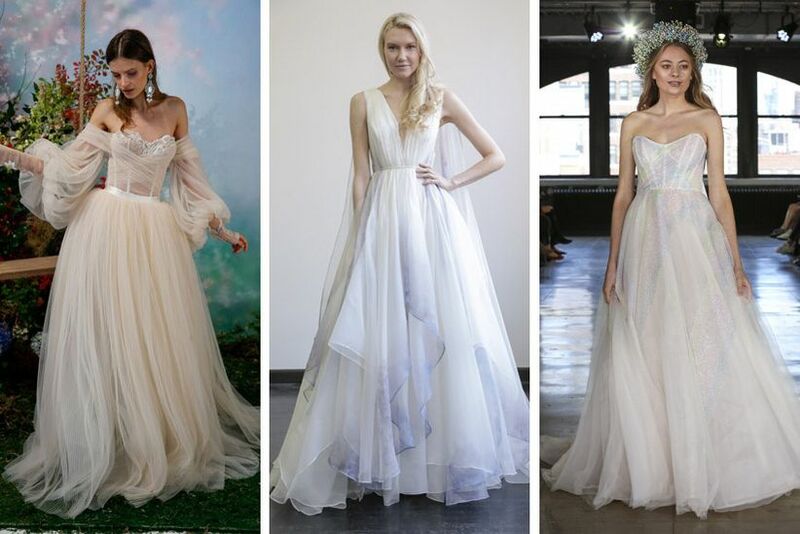 The fashion forecast is in for Canadian brides and you’ve got a ton of awesome 2019 wedding dress trends to look forward to. 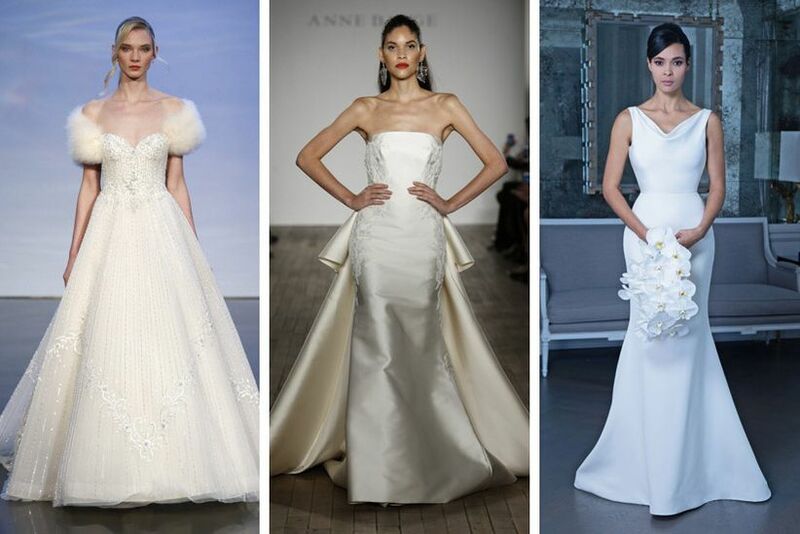 Though white ball gowns will always have a place in hearts, there are a few updates to classic wedding dress silhouettes and styles that should be on your radar. From tiered frills to feathers, these are the styles we’re most excited for. 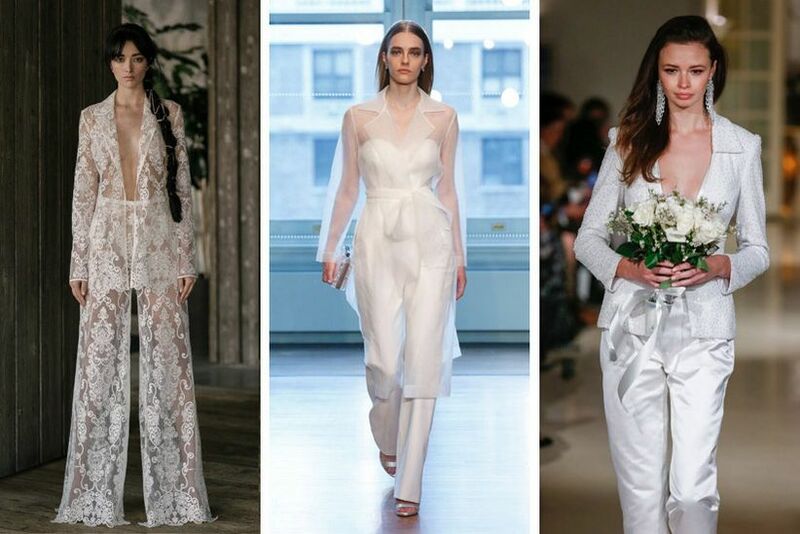 Here are the 2019 Wedding Dress Trends spotted on the runway. 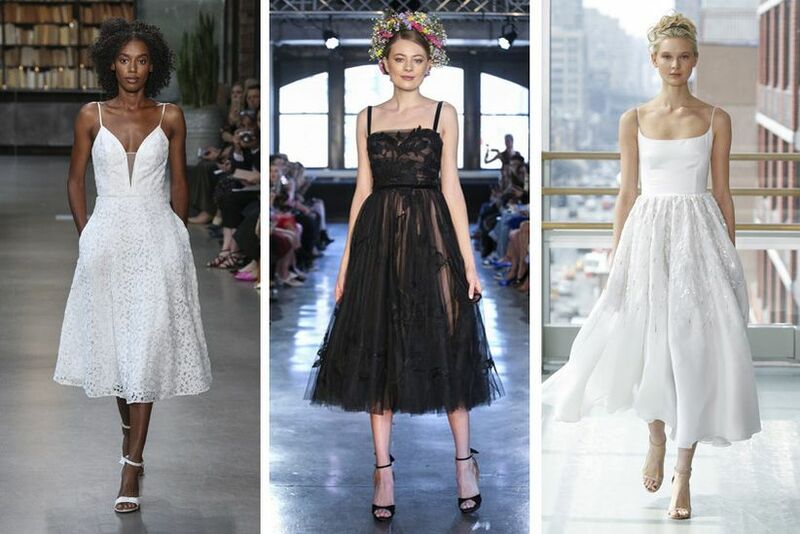 Asymmetrical designs are taking wedding runways by storm this season. 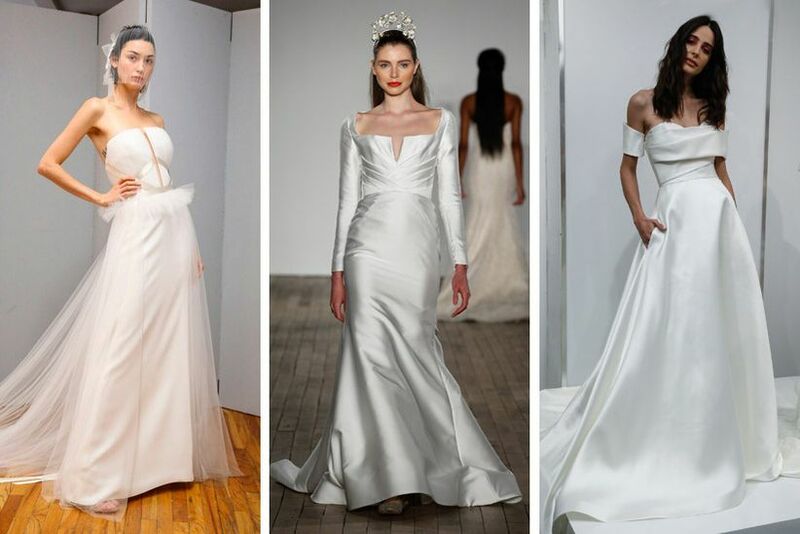 This 2019 wedding dress trend can be worked into sleeves, necklines, skirts or all of the above for a super dramatic look. Shown here, from left to right: Amsale, Ines Di Santo and Hayley Paige. Add a bit of drama to your wedding look by finding a gown with a tiered skirt. These trendy frocks tend to be a bit more avant-garde, so they’re perfect for unconventional brides. Shown here, from left to right: Rime Arodaky, Lazaro and Peter Langner. Who doesn’t love a jumpsuit? The more feminine cousin of the power suit is set to be a huge trend in 2019, so if you don’t love skirts and gowns, you’re in luck. From turtlenecks to plunging necklines, this style has options for every bride’s style. Shown here, from left to right: Christopher Paunil, Mira Zwillinger and Galia Lahav. Of course, many a bride is going to mimic Megan Markle’s wedding dress style and rock a chic, modern-meets-traditional gown. This is the perfect pick for an elegant wedding (bonus points if you’re tying the knot at a castle wedding venue). Shown here, from left to right: Watters, Theia and Paloma Blanca. Coloured gowns aren’t anything new, but this season we’re seeing lots of bold, bright wedding dresses (in contrast to gold wedding dresses and paler shades of year’s past). If you really want your gown to be next-level dramatic, pair this trend with a pattern or go for a bold accent like a contrasting belt. 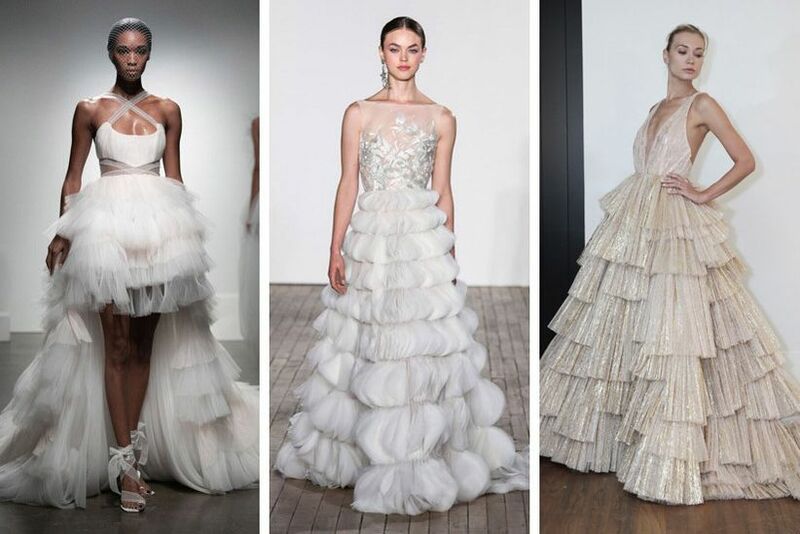 Shown here, from left to right: Ines Di Santo, Vera Wang and Daalarna. 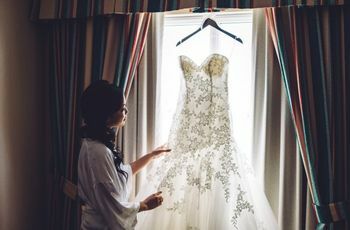 While white dresses are still the fan favourite, rose-hued gowns are anticipated to be one of the biggest 2019 wedding dress trends. 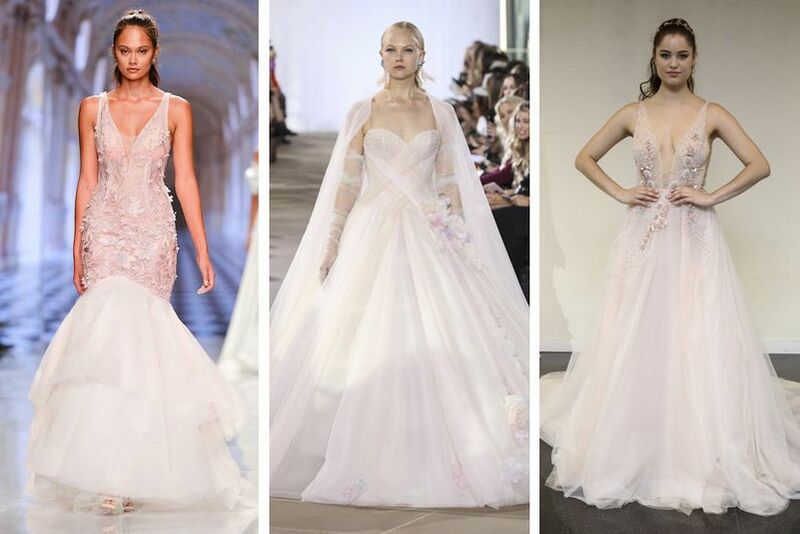 We’re not talking Barbie pink dresses we’re talking soft, off-white shades that give your gown an ultra-romantic, modern edge. Shown here, from left to right: Christopher Paunil, Ines Di Santo and Yumi Katsura. 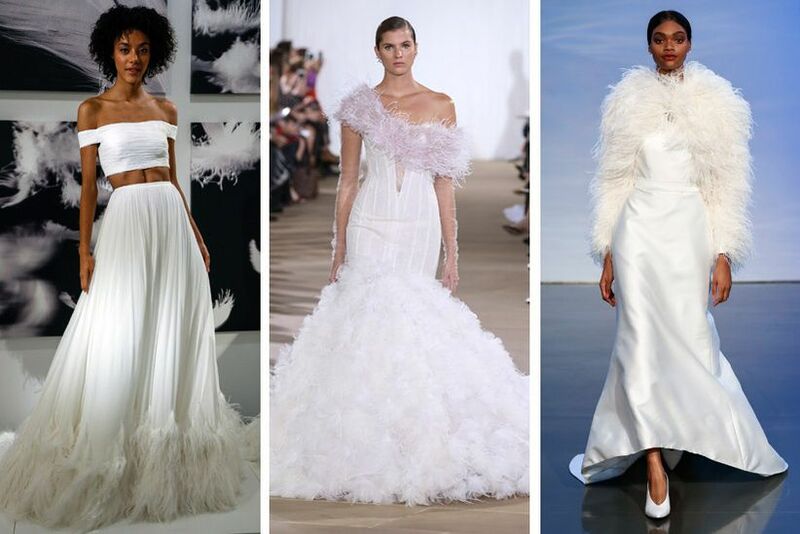 Feathers have been big on red carpets and runways and now they’re working their way into the world of wedding dresses. From feather-trimmed skirts to dramatic sleeves, this style will have you feeling worthy of Vogue as you walk down the aisle. 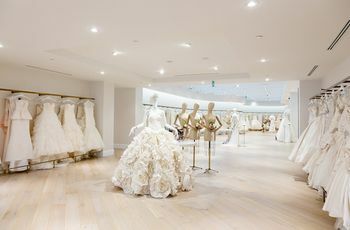 Shown here, from left to right: Pronovias, Ines Di Santo and Justin Alexander. 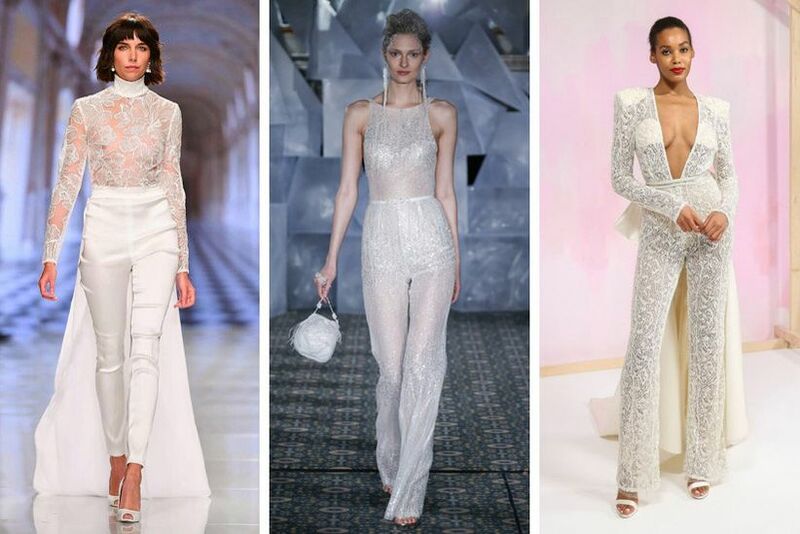 The two-piece bridal outfit trend will still be going strong in 2019. If you’re proud of all that time you’ve put in at the gym, show off your killer abs with a crop top and skirt combo. We suggest looking for a simple, structured top and voluminous style skirt for a look that really packs a punch. Shown here, from left to right: Watters, Hayley Paige and Chosen. 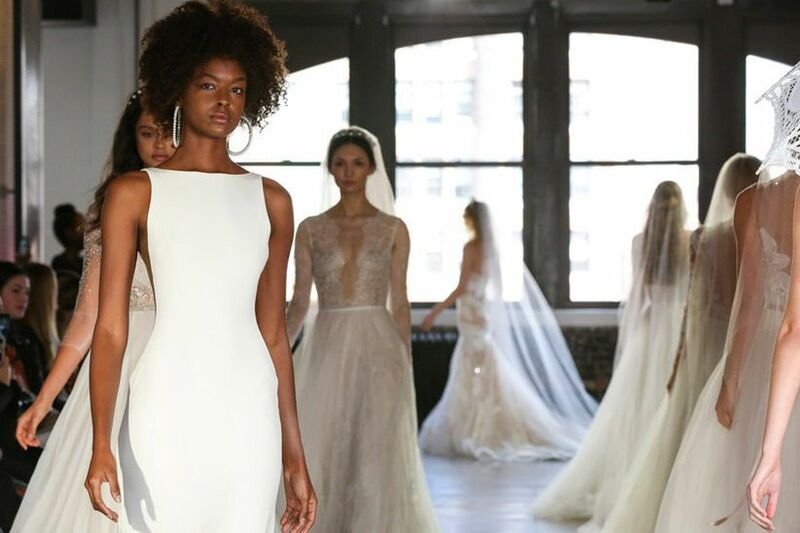 If you’re going for a sleek and chic look, you’ll love this 2019 wedding dress trend. Simple styles are being updated with body-hugging, structured bodices, making them a bit more dramatic. Shown here, from left to right: Angel Sanchez, Anne Barge and Rita Vinieris. Calling all Game of Thrones fans! You may not be able to fly into your wedding on a dragon, but you can rock a Daenerys-inspired dress. 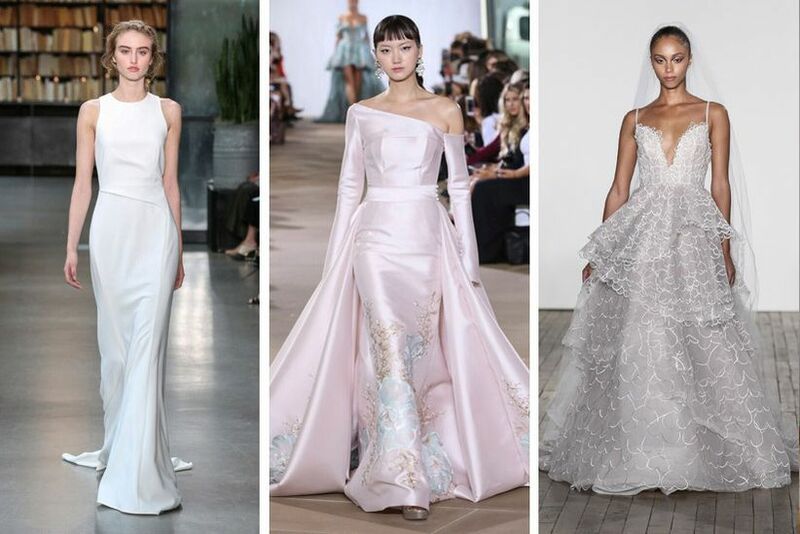 Etherial, regal gowns dominated this year’s bridal shows and will really make your 2019 bridal look one to remember. Shown here, from left to right: Galia Lahav, Leanne Marshall and Willowby. If you’re looking to add a chic, playful touch to your wedding gown, this is a 2019 wedding trend to embrace. 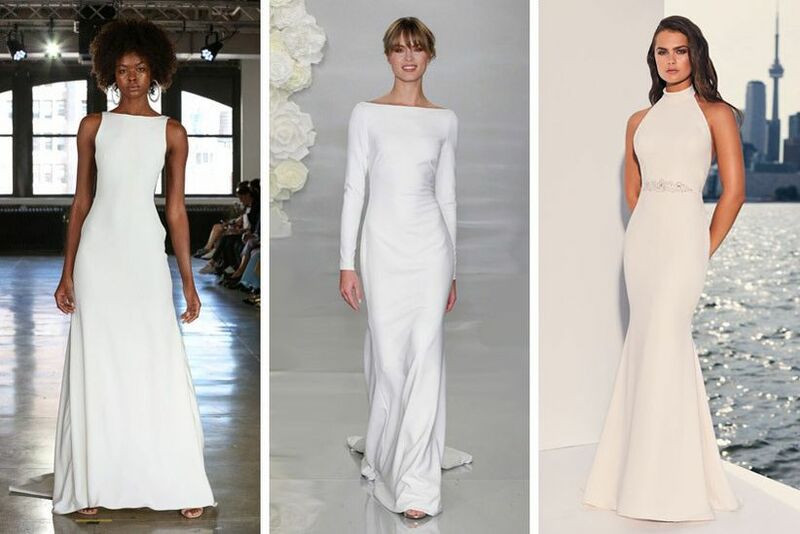 We’re not talking dalmatian-style prints, we're talking soft white features that take gowns to the next level. Gwenyth Paltrow rocked this style at her 2018 wedding, and we highly recommend following suit if you’re tying the knot next year. 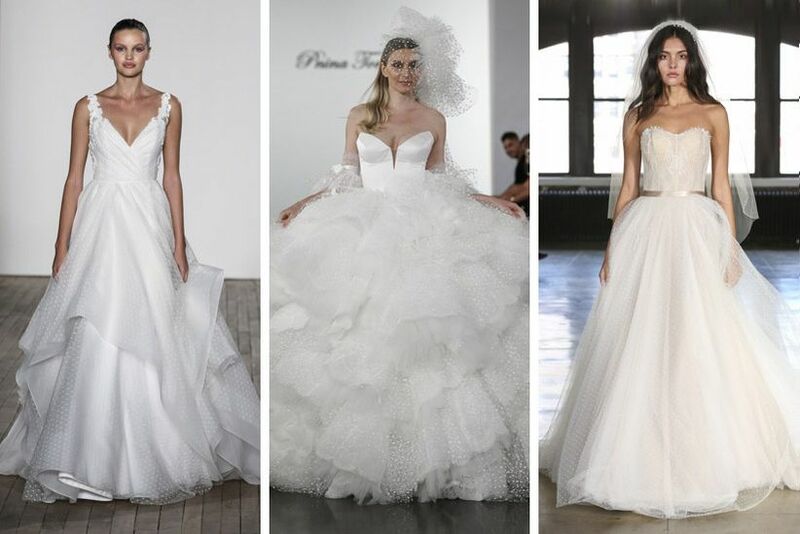 Shown here, from left to right: Hayley Paige, Pnina Tornai and Watters. Who says suits are just for the guys? Embrace that androgynous look and rock a pant and jacket combo on your big day. Nowadays, designers are giving these styles a feminine edge with sheer details, patterned fabrics and feminine silhouettes, but they’ve still got a bit of masculine flair. Shown here, from left to right: Rita Vinieris, Justin Alexander and Oleg Cassini. If you idolize Grace Kelly, Jean Harlow and Marilyn Monroe, you’ll definitely want to jump on this bandwagon. Dramatic, red carpet-inspired styles are one of the hottest 2019 wedding dress trends. These show-stopping styles are typically vampy and hug your curves, perfect for showing off that bridal bod! Shown here, from left to right: Justin Alexander, Anne Barge and Romona Keveza. This isn’t exactly a new trend, but the tea-length wedding dress is getting an update in 2019. Instead of vintage lace frocks, expect to see edgier incarnations of this style, like dramatic black designs and looks with plunging necklines and metallic details. Shown here, from left to right: Amsale, Wtoo and Gracy Accad. If your legs are your best asset, you’re in luck! 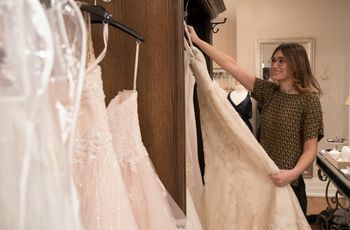 Mini wedding dresses are expected to be huge in 2019. Yes, many brides rock shorter white frocks for pre-wedding parties and/or their reception, but they’re expected to be big for ceremonies this upcoming year. P.S. 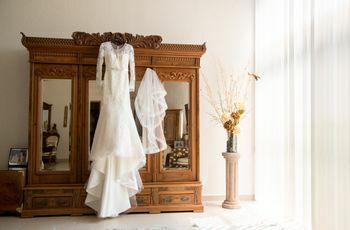 this is awesome news for bargain brides as you may be able to find a white cocktail dress in a local department store that costs less than something off the runway. 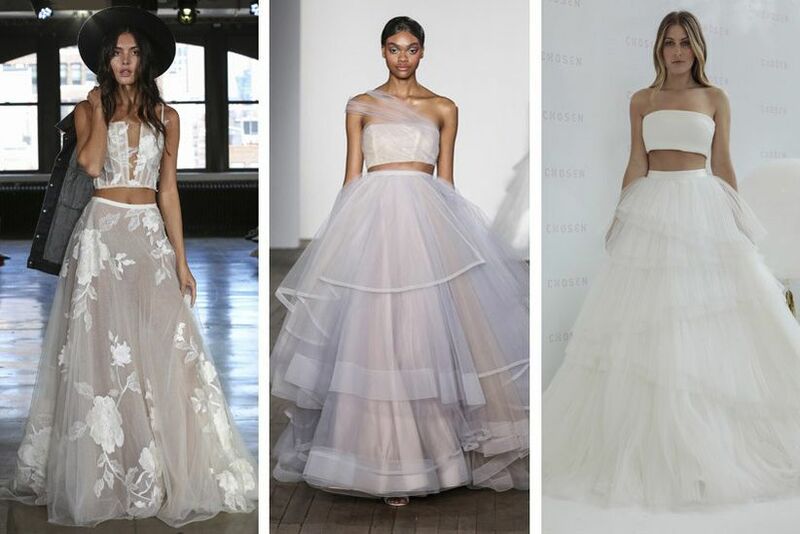 Shown here, from left to right: Amsale, Hayley Paige and Inbal Dror. Runway photography by Dan Lecca. Browse our gown galleries by wedding dress silhouette, neckline and designer.